granite, marble and soapstone countertops immediately transform a kitchen or bathroom from good to great. While aesthetics may be subjective, the tangible response people have to natural stone countertops is always positive because they look so great. Natural stone countertops last a lifetime. They are incredibly durable, require minimal maintenance and can withstand the spills, accidents and mishaps that often accompany day-to-day living. Hot cups of coffee, spilled wine and even slicing knives rarely damage granite, marble and soapstone. 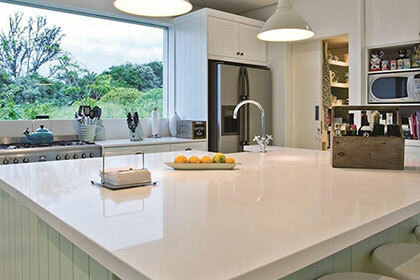 Of all the countertop materials available to you, none will enhance the overall value of your home like natural stone. Granite, marble and soapstone are always desirable and always in style. They are, in a sense, timeless but at the same time contemporary. Many homebuyers have made the decision to buy based on the natural stone countertops alone. With natural stone, you truly have the flexibility to design the countertops of your dreams. If you are asking yourself whether to install natural stone or some other kind of countertop, connect with JSC Stone. Ask about natural stone's aesthetics, durability, value and flexibility—and then find a unique slab that's right for you and your home.